Higher temperatures mean less efficient transmission, as per a new federal climate report. The authors, drawn from 13 federal agencies under the U.S. Global Change Research Program, note negative impacts of extreme weather events on power generation and transmission systems, predicting more and longer-lasting power outages that could cost billions of dollars. They also point to the challenges and opportunities presented by an electricity system increasingly reliant on natural gas and renewables. And they urge a focus on resilience in the face of increasing severe events like wildfires and hurricanes, which have already imperiled the existence of some U.S. utilities. While low-lying and coastal energy facilities and systems face threats from hurricanes, flooding and rising sea levels, inland energy infrastructure “in every region” will be hit with extreme precipitation. Drier conditions and drought in some areas threaten transmission and other infrastructure with wildfires. 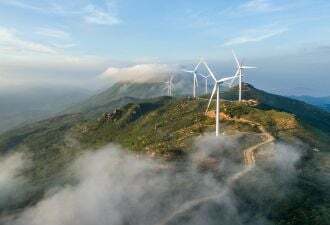 And rising temperatures mean not only increased demand for cooling, but also reduced output for thermoelectric generation and lower efficiencies for transmission. 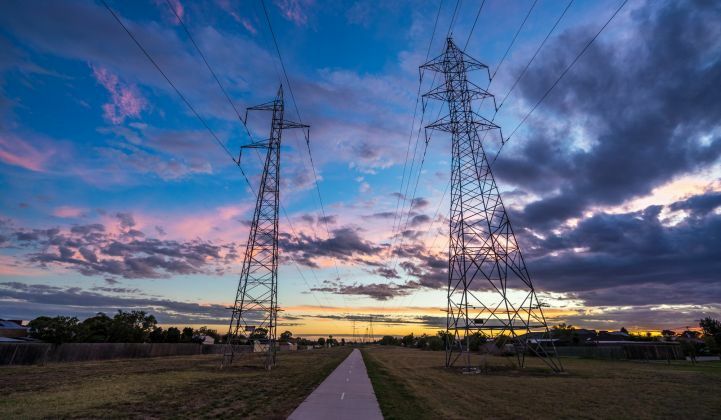 Weather and climate changes affect not just fossil fuel generation facilities, but transmission and distribution, substations and output from renewables due to changing weather patterns. The impacts could be even more severe because the nation’s energy infrastructure is so old. According to the authors, 70 percent of the grid’s transmission lines and power transformers are over 25 years old and the average power plant is over 30 years old. 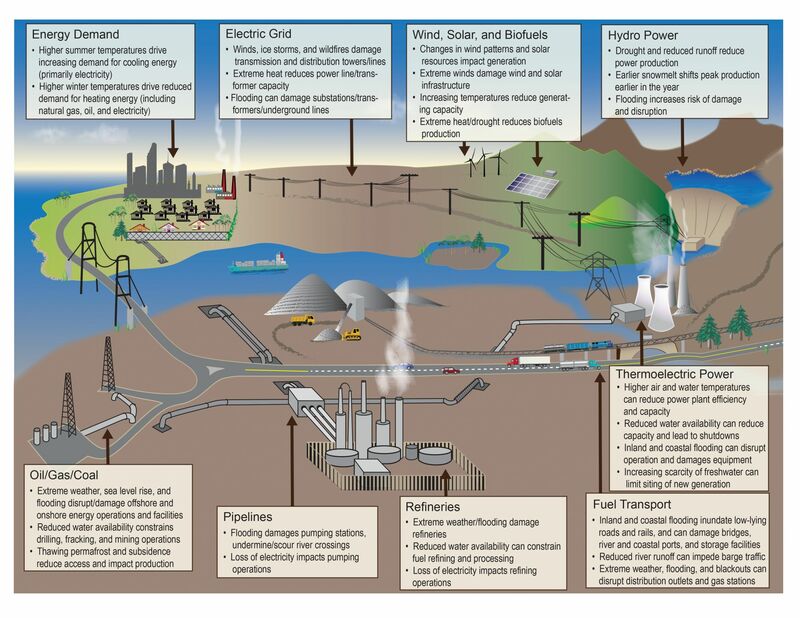 Climate challenges and their impacts on an aging grid will mean significant costs. Electricity consumers will suffer the economic impacts of climate change as well. With a forecasted increase in electricity demand between 2 and 9 percent by 2040, considering all climate change scenarios, energy expenditures are expected to grow between 4 and 18 percent. 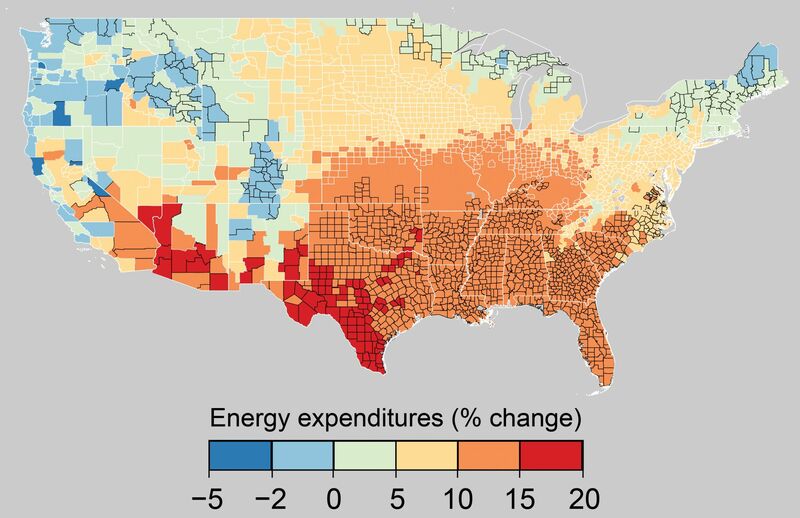 In the chart above, which shows median projected energy expenditure increases for impacts 2080 to 2099 in a high climate change scenario, costs are highest in the Southwest and Southeast. Higher energy demand is expected to increase energy expenditures $21 billion to $87 billion by the end of the century. Solar, wind and natural gas are driving that transformation. Scientists note that solar generation grew by 44 percent in 2016 and wind generation by 19 percent that same year, according to data from the Energy Information Administration. In the last decade, generation from wind and solar grew from 1 percent to over 5 percent. The report notes that “natural gas and renewable resources are moving to the forefront.” The increase of renewables on the grid present both opportunities and challenges. “These changes offer the opportunity to diversify the energy generation portfolio and require planning for operation and reliability of power generation, transmission, and delivery to maximize the positive effects and avoid unintended consequences,” write the report’s authors. While many renewables don’t face the challenges tied to fuel deliveries that thermal resources do, solar and wind infrastructure can also be impacted by extreme weather. Climate change also threatens hydropower — especially in western areas where declining mountain snowpack means less water — from more variable water accessibility as climate change progresses. The report notes that long lasting drought in California caused hydro output to drop 59 percent in 2015 compared to historic production. The report suggests that dispatchable natural gas can fill in for renewable intermittency. Authors also point to demand response, energy efficiency, microgrids and energy storage as ways to build grid flexibility, reliability and resilience. Some resilience efforts are already underway. Authors note city adaptation plans; partnerships like the Charleston Resilience Network, a public, private and nonprofit collaboration to build a regional resilience strategy; and federal efforts like the Department of Energy’s Partnership for Energy Sector Climate Resilience, which works with utilities on planning and climate vulnerability studies. To fill in the gap, the report notes the need for efforts such as more reliable climate projections, risk reduction strategies at all levels of planning, and metrics to define the benefits of resilience efforts. The report cautions that the energy choices made today have long-lasting implications, especially as climate change intensifies. The findings are not new. They’re based on existing, peer-reviewed science. But the conclusions do stand in contrast to the Trump administration, which tried to bury the findings by releasing the report near Thanksgiving. But the release underscores the urgency of global climate action recently raised by another foreboding report, from the United Nations, which warned “that we only have the slimmest of opportunities remaining to avoid unthinkable damage to the climate system,” according to one author.